By Shokufeh Kavani - Persian Mirror - U.S.A. This is the year of Mevlana and we all try to contribute our share to Mevlana Rumi, one of our greatest poets and Sufi's who became a worldwide phenamenon and lives ever happily after in people's heart all over the world. 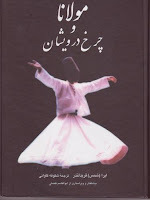 I would like to introduce to you the book that I translated from English into Persian about Mevlana Rumi, written by Ira Friedlander by the name of 'Whirling Dervishes ' which has been published in Iran, year 2003 and has sold out. The first time I saw the English version of the book, I was amazed by the beauty of the photos that Mrs. Ira Friedlaner, now the head of the apple graphic centre at American Cairo University, and Mr. Nazieh Oozal have taken from the Konya, Mevlana tomb and the Whirling Dervishes ceremony. It is beautifully captured in black and white and takes the readers inside the world of these holy men. This book also narrates the last 200 years of the Mevlavieh sect and what has happened to them and their centres in Turkey and during the power of Kamal Attatork from a very good historical angle. Shokufeh Kavani moved to Australia in 1997 and is currently living in Sydney. She works as an operating theatre nurse but considers art her true passion. She has been nominated for the "Australian of the Year Award 2005 & 2007 " and "The Pride of the Australian Medal" by the Daily Telegraph magazine. "Sufism Has Always Been More Feminine"
Is it Taqwa or Loneliness? "Politics Corrupts Religion and Not Vice Versa"
"Gel, Gel, Ne Olursan Ol, Gel!" "We Were Talking about Poetry"